This ultra-quick and delicious shortcut makes one great risotto. 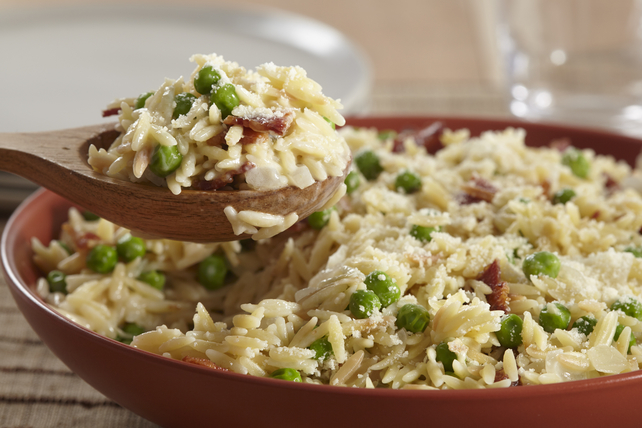 Made with peas, bacon, Parmesan, cream cheese and orzo pasta, this Orzotto with Peas & Bacon is a tasty twist on an Italian classic. Heat oil in large saucepan on medium heat. Add onions; cook 2 to 3 min. or until softened, stirring frequently. Add pasta; cook and stir 2 min. or until lightly browned. Stir in chicken broth. Bring just to boil; cover. Simmer on medium-low heat 8 to 10 min. or until pasta is tender and broth is absorbed, adding peas for the last minute. Remove from heat. Add cream cheese product, bacon and 1/4 cup Parmesan; stir until cream cheese is completely melted and mixture is well blended. Serve topped with remaining Parmesan. Substitute your favourite kid-friendly vegetable, such as halved grape tomatoes or cooked small broccoli florets, for the peas. Add 1/2 cup chopped cooked chicken to the cooked pasta along with the peas.